No one understands the importance of staying neat and tidy...like a cat. ...the Saturday Pet Blogger Hop! So true... until it comes to flinging litter outside of the litter box!! Purrs from the Zee and Zoey Gang! Very true and that was neat. Mom: Ohhhh...noooo Bucky do not look *hand over Bucky's eyes* Just. Don't. Look. Mom: OW! Ok, but I warned you. Mom: So sorry....Happy Caturday everyone! ALLIE!!!!! What are you DOING??? You're letting a BOY touch you??? You're REALLY going to need a bath when this is all over. Spa day for Allie. Make sure that boy does a throrough job! I hope he doesn't expect a tip. That's shocking! Was that really you, Allie? Were you nipped out? 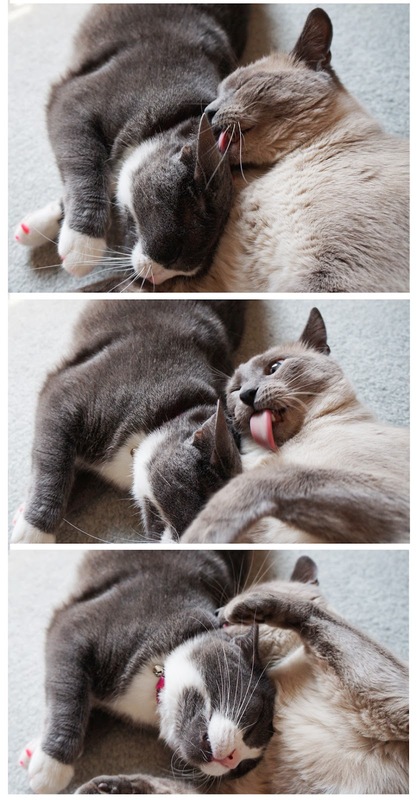 I wish my kitties would get along like this! Indeed.....we cats know ALL about neat and tidy (unless of course you're talking about litterboxes....hahaha). Allie you have spit behind your ears! We'd hafta agree with you on that one! way to go Allie! Gimme 4 highpaws! *whap* Nice! You got him to clean all those hard to get spots...and no gratuity needed! Sweet! These are really about as sweet as can be. Mommy sez Maxie sure is concentrating HARD to get the job done *just right*! MOL!! Very true. Cats are pretty clean creatures! And to coerce your brother into bathing your head--PRICELESS! Maxwell, I would give you ALL my treats and jars of Gerbers to take your place for even five minutes. Well done Allie, getting that boy to wash your face and ears. Smart girl. Hope all of you have a great day. awwww you both are so precious. So true. If dogs are obsessed with sniffing butts, cats are obsessed with licking. LOL.